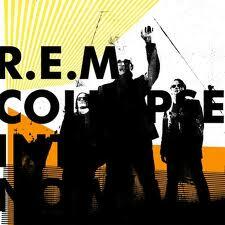 First Impressions: Collapse Into Now by R.E.M. The pre-release buzz proclaimed Collapse Into Now a return to form for R.E.M., a groundbreaking band that floundered after drummer Bill Berry’s departure. I didn’t buy this line: 2008’s Accelerate with its 34 minute blast of guitar rock was the clarion call announcing R.E.M. had found its way again. This latest album isn’t the second coming, but it is another good album from the trio. Does R.E.M. still have something to prove? They seem to think so. On the second track, “All the Best,” Stipe sings “I’ll think I’ll sing and rhyme, I’ll give it one more time, I’ll show the kids how to do it, fine, fine, fine.” And over the course of 12 songs in 40 minutes, they attempt to do just that. With droning guitars, “Discoverer” starts the album in dramatic fashion, an uplifting blast, followed by the urgent vocals of “All the Best.” This initial momentum then dissipates over the course of four slower numbers. While these are all successful to various degrees (I particularly like the country twang of “It Happened Today”), I would have sequenced the album differently. The problem for someone who’s listened to R.E.M. for 30 years is that it’s almost impossible just to listen to an album on its own merits. I can’t help but hear sounds from every era of their career. (I also freak out a little seeing lyrics included in the digital booklet: I still remember the shock of finding the lyrics to “World Leader Pretend” when I opened Green – the first R.E.M. lyrics included in an album.) “ÜBerlin” combines “Drive” and “Electrolite,” while “Oh My Heart” references Out of Time-era mandolin. “Blue” mixes “Belong” with “E-Bow (The Letter)” (right down to the guest vocal from Patti Smith and Stipe’s spoken word verses). “Blue” is a beautiful album closer, starting with a haunting distorted guitar, and Smith’s always mysterious voice. It switches like an Arcade Fire track at the end, with a beautiful droning guitar, soaring background vocals and chants of “Discoverer” echoing the opening track. I listened to the digital version so I didn’t get the full audio experience, but the production doesn’t seem great. Stipe’s voice is a bit harsh on some of the quieter songs. It’s always been acquired taste but there’s been some nuance there. It’s lacking in some songs. And the mix generally sounds a bit tinny, if not amateurish. Then there’s the aforementioned sequencing issue. The first and last tracks are right, but I might have changed the order in between. Still, this album gets my recommendation. A fine outing from one of the very first “alternative” groups (from when that meant something and wasn’t just another industry label). Enjoyed the review. I'm relieved to read that you hear the sound quality as tinny. I agree and was afraid it was me. I thought it might be the digital compression but I've now listened to thousands of iTunes songs and haven't noticed this to be a major issue.